The aim of paper is to present the level of respondents involvement in the commune affairs. The results of the analyses presented in this paper come from surveys conducted using a questionnaire survey among residents of rural communes in the West Pomeranian Voivodeship. After rejecting incomplete and/or illogical questionnaires, 2,409 respondents were qualified for the analysis. The results confirmed the relationship between social capital and involvement of inhabitants in the community affairs. Verification of the existence of a relationship between the involvement in the commune affairs (social capital component) and the education of the respondents was verified. The research results indicate the diversity of involvement in level of education groups. The respondents with a minimum level of secondary education noted a positive average level of involvement, which means that they showed more interest in commune matters and willingness to get involved in them. The highest level of involvement was noted in the group of people with post-secondary education. 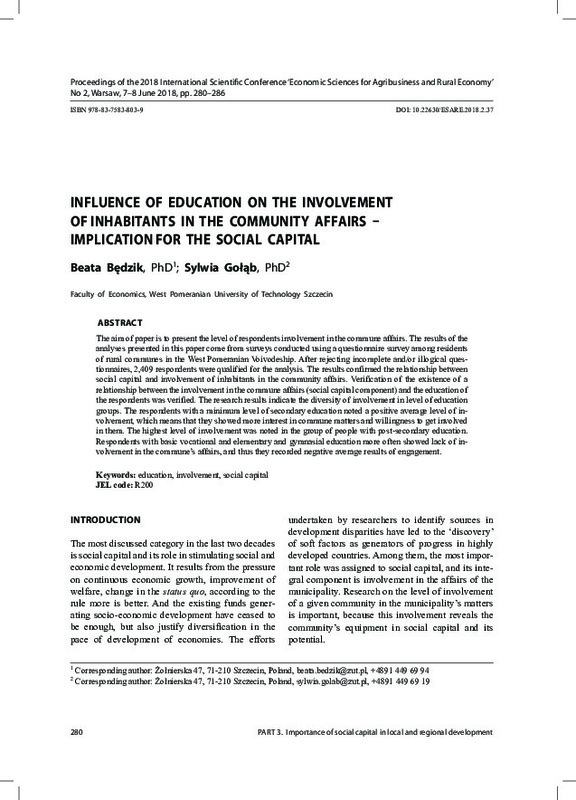 Respondents with basic vocational and elementary and gymnasial education more often showed lack of involvement in the commune’s affairs, and thus they recorded negative average results of engagement.